THE PENDULOUS GROWTHS upon the right side of this patient's head, and a number of small and soft tumors on various parts of the body, were congenital. During childhood, and even until thirty years of age, the tumor of the scalp steadily increased in size, from year to year. Since coming to this country, sixteen years ago, patient thinks there has been no permanent change. Patient suffers more inconvenience from the weight of the tumor in summer than in winter. When exposed to a low temperature in winter, the lax tissue becomes icy cold, but have never been at all benumbed. 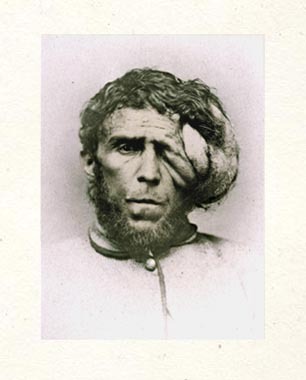 About five years ago, while at work, a shovelful of gravel was accidentally thrown against the right side of his head, on account of which accident he entered Bellevue Hospital, April 1874. The growth was injured, several slight wounds continued to discharge, and an attack of erysipelas (St. Anthony's fire) supervened. Since then he has been employed in hospital and has suffered again from erysipelas, to which affection he seems unusually prone. The treatment of fibroma is not imperative, as the affection occasions no discomfort. he's a freak; you want your kids to look like him? You'd mark them lookin' at that nine months. It'd turn your baby's head to a mess like his." I said, "it don't look bad at all." and plummet-measured in chiseled proportions. her father's, husband's—perhaps her son's. But does such guessing chronicle a true history? of culture and prejudice see? imagine you never saw it. Then consider who you see. O Columbia! It is your blood in him. white milk, the music of forest flutes. and in his famed smock, as well! guesses—nothing the eye can see." George Fox's words and my lines give to the first. what top-spinning warmth, he was already accustomed? It could have been a different life.